The femoral artery is the continuation of the external iliac artery and begins as the external iliac artery passes under the inguinal ligament to enter the femoral triangle on the anterior aspect of the upper thigh. 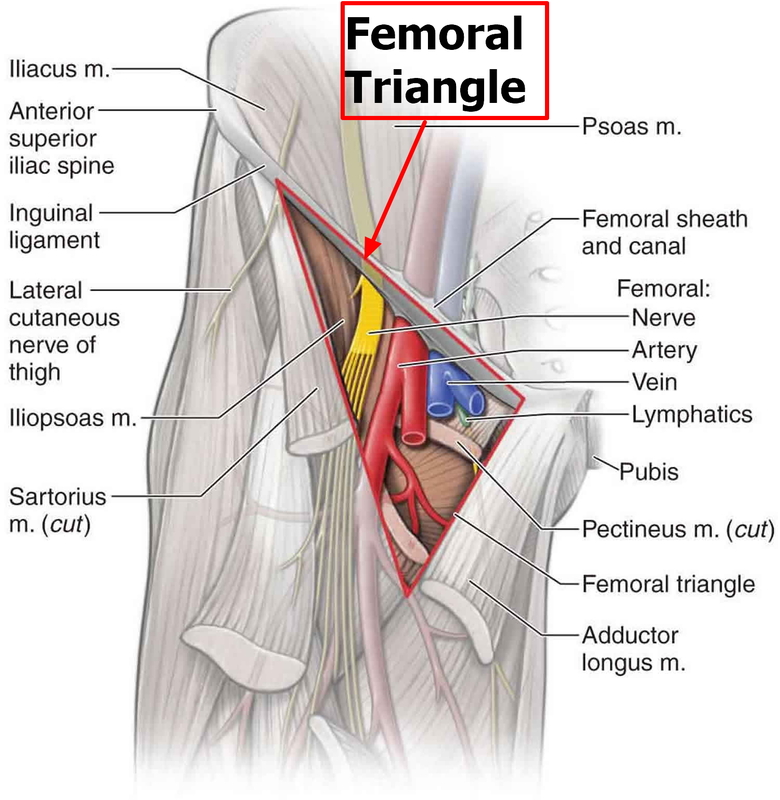 The femoral triangle (Figure 3). The base is formed superiorly by the inguinal ligament, medially by the lateral border of the adductor longus muscle, and laterally by the medial border of the sartorius muscle. The apex is formed by the crossing of the adductor longus by the sartorius muscle. The contents of the femoral triangle, from lateral to medial, are the femoral nerve and its branches, the femoral artery and several of its branches, the femoral vein and its proximal tributaries, and the deep inguinal lymph nodes. The femoral artery is palpable in the femoral triangle just inferior to the inguinal ligament midway between the anterior superior iliac spine and the pubic symphysis. The femoral artery is easily accessible within the femoral triangle and is the site for insertion of catheters that may extend into the aorta and ultimately into the coronary vessels of the heart. Such catheters are utilized during cardiac catheterization, coronary angiography, and other procedures involving the heart. A cluster of four small branches – superficial epigastric artery, superficial circumflex iliac artery, superficial external pudendal artery, and deep external pudendal artery – originate from the femoral artery in the femoral triangle and supply cutaneous regions of the upper thigh, lower abdomen, and perineum. The largest branch of the femoral artery in the thigh is the deep artery of the thigh (profunda femoris artery), which originates from the lateral side of the femoral artery in the femoral triangle and is the major source of blood supply to the thigh (Figure 1). The deep artery of the thigh immediately passes posteriorly between the pectineus and adductor longus muscles and then between the adductor longus and adductor brevis muscles, and then travels inferiorly between the adductor longus and adductor magnus , eventually penetrating through the adductor magnus to connect with branches of the popliteal artery behind the knee. The deep artery of the thigh has lateral and medial circumflex femoral branches and three perforating branches. The femoral artery passes vertically through the femoral triangle and then continues down the thigh in the adductor canal. It leaves the canal by passing through the adductor hiatus in the adductor magnus muscle and becomes the popliteal artery behind the knee. Branches of this artery supply blood to the knee joint and to certain muscles in the thigh and calf. 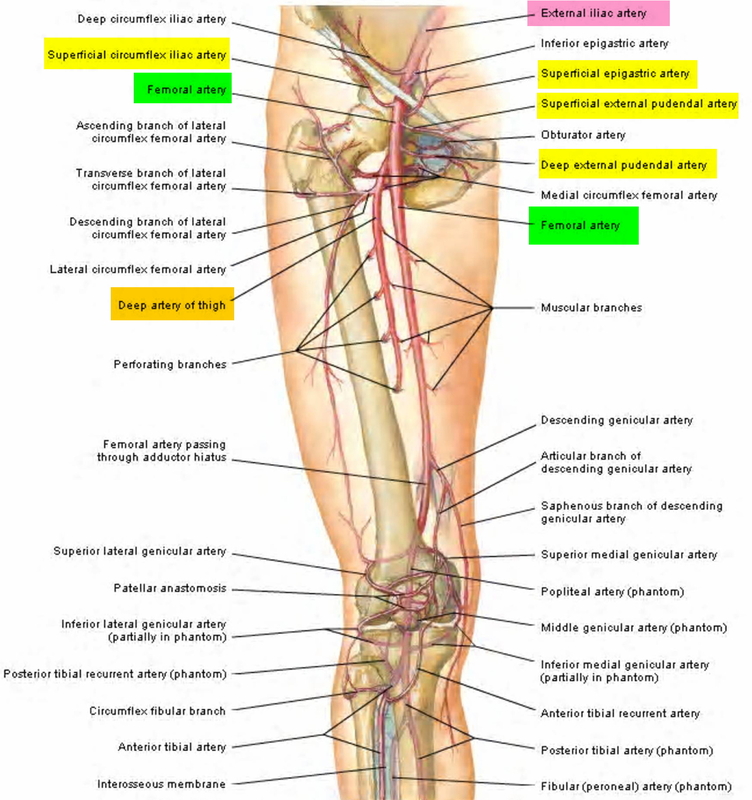 The popliteal artery diverges into the anterior and posterior tibial arteries. The anterior tibial artery passes downward between the tibia and fibula, giving off branches to the skin and muscles in the anterior and lateral regions of the leg. This vessel continues into the foot as the dorsalis pedis artery (dorsal pedis artery), which supplies blood to the foot. The posterior tibial artery, the larger of the two popliteal branches, descends beneath the calf muscles, giving off branches to the skin, muscles, and other tissues of the leg along the way to the foot. Peripheral artery bypass is surgery to reroute the blood supply around a blocked artery in one of your legs. 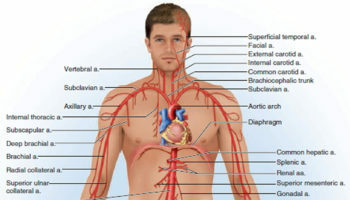 Fatty deposits can build up inside the arteries and block them 1). Peripheral arterial disease happens when there is a narrowing of the blood vessels outside of your heart 2). The cause of PAD is atherosclerosis. This happens when plaque builds up on the walls of the arteries that supply blood to the arms and legs. Plaque is a substance made up of fat and cholesterol. 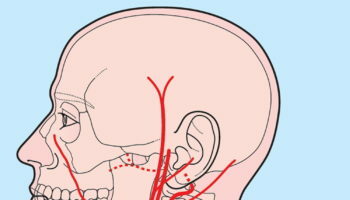 It causes the arteries to narrow or become blocked. This can reduce or stop blood flow, usually to the legs. If severe enough, blocked blood flow can cause tissue death and can sometimes lead to amputation of the foot or leg. The main risk factor for peripheral arterial disease is smoking. Other risk factors include older age and diseases like diabetes, high blood cholesterol, high blood pressure, heart disease, and stroke. Peripheral arterial disease can increase your risk of heart attack, stroke, and transient ischemic attack. Doctors diagnose peripheral arterial disease with a physical exam and heart and imaging tests. Treatments include lifestyle changes, medicines, and sometimes surgery. Lifestyle changes include dietary changes, exercise, and efforts to lower high cholesterol levels and high blood pressure.